Following Intel’s surprising departure from the Science Talent Search, the event officially has a new sponsor—biotech giant Regeneron. What does that mean for the country’s most iconic science competition? We never really got a full explanation about why Intel withdrew from the illustrious youth science contest, although the fact that the company is cutting budgets and staffing is likely a factor. Many people saw the move as symbolic, however, as the PC chip maker has been struggling to maintain its relevance as mobile and cloud computing has risen. The Science Talent Search is something of a bellwether of the country’s attitudes toward science, having started in 1942 with sponsor Westinghouse, which ceded the role to Intel in 1998 during the rise of the internet and personal computing age. So it’s symbolically appropriate that the recipient of the latest torch passing is a biotech firm—Regeneron Pharmaceuticals, Inc. announced it would take the primary sponsorship, beating out dozens of competitors and four finalists (did they have to create tri-fold posters?). After all, biotech is hot right now, and a lot more of the finalists in the competition’s latest round are doing work that resembles what happens in a drug company than a semiconductor manufacturer. Regeneron is one of the hottest such firms around, with its shares increasing by 2,900 percent in the past decade, and market cap at more than $40 billion. The secret to its success is a hit drug to treat age-related blindness, along with new products to treat high cholesterol, and potential drugs on the way for arthritis and dermatitis. Keep on fixing our aging bodies, Regeneron! The company is also pumping some new life into the competition with $100 million over 10 years, significantly increasing the award money. But the best part about the company’s commitment is the fact that it’s setting aside $30 million for outreach and equity to serve underprivileged communities. Regeneron already had its own STEM education programs in place, funding several annual internships and mentoring programs. 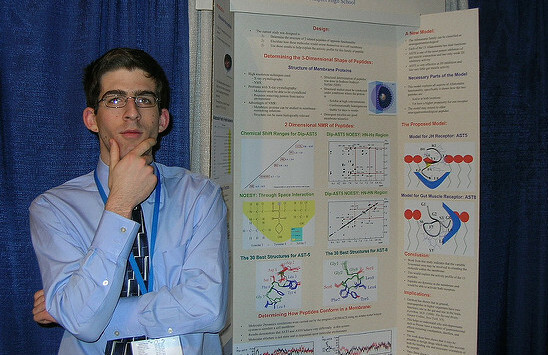 This kind of supplemental work is crucial, as critics increasingly call science competitions outdated, usually favoring rich kids with access to adult support. If the Science Talent Search is going to retain relevance, it needs to provide more avenues for a range of kids. Related: Hey, STEM Funders: What If Science Competitions Aren’t Good for Kids? The Science Talent Search always draws some amazing work, and has definitely encouraged a lot of its alumni to go on and do great things. In fact, co-founders of Regeneron, Leonard Schleifer and George Yancopoulos, both competed in the 1970s, and cited the experience as an influence on their pursuit of science. Yancopoulos has said he came away with the message that scientists can be role models, and he wants such inspiration to continue. But what other kind of message does the new sponsor send? After all, biotech is an exciting field, but as science writer Carl Zimmer pointed out following the announcement, industry profits are coming from extremely expensive drugs that are inflating health care costs. Regeneron’s cholesterol drug sells for more than $14,000 a year. In other words, you can be a scientist and still become really rich. It’s definitely easy to imbue too much cultural significance into something like a science fair sponsorship, but it does feel like this new iteration is not only cultivating the next Nobel Prize winners, it’s also cultivating the next billionaires.